I made this on a whim late last night and it was still cooling when I went to bed. Since the recipe was completely improvised, I had no idea if it was successful until I woke up this morning. So when I rolled out of bed (way too early), the first thing I did was cut into the cake! 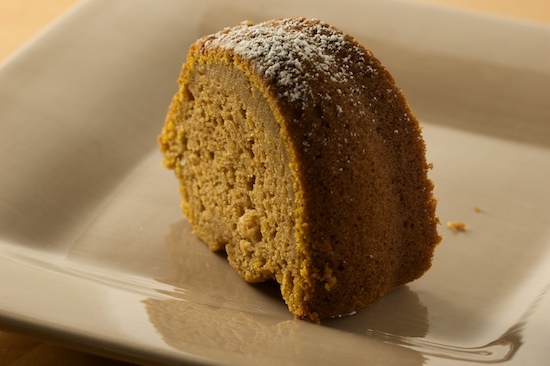 While I wouldn’t suggest eating cake for breakfast on a regular basis, this Pumpkin Spice Cake turned out to be the perfect day-before-Thanksgiving breakfast for my husband and I. It was moist, spicy, and delicious…exactly what I was hoping for! I’ve always loved spice cakes served with nothing more than a sprinkling of powdered sugar on top. This cake is moist enough to stand on it’s own, and serving it without frosting or glaze allows the warm and wonderful spices to shine. This recipe is loosely based on a Walnut Spice Cake recipe from The Gourmet Cookbook. But I added some ingredients, removed others, and changed amounts of the remaining ingredients, so it really was quite an improvisation. I also changed the method, so it’s simple to put together, much like a quick bread. In fact, you could really say this is a quick bread that is baked in a Bundt pan. Call it what you like, I say it’s delicious, easy, and worth baking! 1. Preheat oven to 350 degrees. Butter and flour a Bundt pan or use a baking spray with flour in it. 2. In a medium bowl, sift or whisk together flour, sugar, baking powder, baking soda, salt, and spices; set aside. 3. In a large bowl combine eggs, sour cream, pumpkin, oil, and vanilla extract. Beat well with a hand mixer (or use a stand mixer), scraping down sides with a spatula, until everything is well blended. Add flour mixture a little at a time, beating well after each addition, until everything is well combined. Make sure to scrape down the sides of the bowl as you go. *Pumpkin pie spice can be substituted with 2 teaspoons cinnamon, 1 teaspoon ground ginger, 1/2 teaspoon ground allspice, and 1/2 teaspoon ground nutmeg (or make your own combination). Make sure to butter your Bundt pan really well and get into all the crevices. I like to use a spray like Baker's Joy because I've never had a problem with cakes sticking to the pan when I use it. I hope you all have a wonderful Thanksgiving tomorrow! We’re heading up to Central California to spend Thanksgiving with my family so my next few blog posts will be from there. Hope my family has some great new recipes I can steal and share with you! omg, i want a slice of this for lunch! totally good for breakfast... french toast? :) have a great thanksgiving!!! 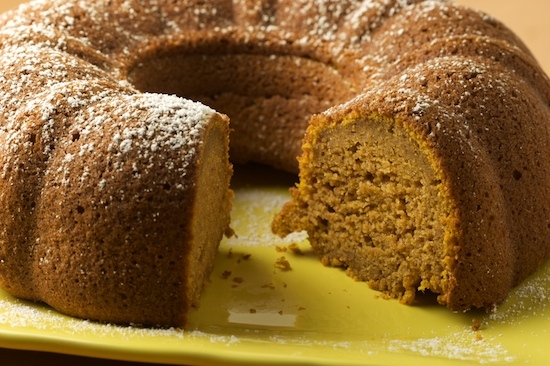 What is better than a slice of tender pumpkin cake? I love it for breakfast, too. Why not? Have a safe trip and a lovely Thanksgiving! Oh, this looks fantastic! I'm so wishing I had some with my coffee! Happy Thanksgiving! uh, this IS a perfect breakfast! i love the sound of this. i don't think i've made a pumpkin cake in a couple of years now. must remedy. quick. happy thanksgiving! This cake looks soooo moist I can't wait to try it... I have been experimenting with whole white wheat flour and maybe I'll try it with this recipe.. I'm gonna miss your posts every day showing up this month... I look so forward to seeing what you cook everyday. Nice! More pumpkin recipes for my growing list of things I am going to do with my 2 gallons of pumpkin. It looks so delicious! Happy Thanksgiving Nicole! We hope you, Justin, and Smack have a great weekend! That looks so good! I love how moist it is! Big yum! Try telling that to an Italian! My husband insists that it is perfectly normal to eat cake for breakfast. You probably noticed it when you were in Sicily as well?I'm not a big pumpkin lover but that cake looks delicious! Hope you have a lovely Thanksgiving. This might almost beat out pumpkin pie for dessert today. WOW that looks so good. I didn't have all the ingredients. I used olive oil, I used 1/2 tsp of allspice, 1/2 tsp of nutmeg, 1 tsp ginger, forgot the cinnamon, and 1/2 tsp cloves. I forgot the salt. I am allergic to eggs so I used flax meal I ground myself. 1/2 cup of flax meal. I didn't have vanilla or sour cream. I used a beautiful Princess House bundt cake dish, and it will come out just as pretty, and the smell will be just as wonderful, but it won't taste nearly as great as your cake. I can sprinkle cinnamon on it. I already sprinkled the salt on because when I cook and I am in a hurry, and I don't have everything anyway, it just works out, or it flops but it still smells good and maybe that is what it is all about on Thanksgiving. Cake for breakfast is a fine idea, Nicole, especially something not overtly cakey such as this. I'm reminded, weirdly, of a poster I saw in a White Castle hamburger joint. While McDonald's and others were busy touting their breakfast menus, White Castle just put up posters featuring their iconic "slider" hamburger, with the headline, "Hamburgers for breakfast. Why not?" For years, one of those posters was framed and proudly displayed in our kitchen. Happy Thanksgiving to you and your family. I am so a cake fan and would defineately have a slice upon waking up every morning, especially with a hot cup of coffee. Looks super moist! Hope you had a nice Thanksgiving and a wonderful trip! I just made this cake today and it is delicious! My friends and family are really enjoying it. Thanks for passing it on. i just ran across this one. (im hooked on your site now). i searched all last week for this exact recipe, without any luck. couldnt seem to find a spice cake with pumpkin that didnt call for butter milk. so i ended up with plain spice cake. it was pretty good, but this looks much better! how can you make the a "canned pumpkin equivalent" using real a real pumpkin?thanks! YUM! I just made this last night for a work function. And I might eat it all before the event actually starts! Thanks for the recipe! This looks so yummy! I'm going to take a crack at making it, but I have no bundt pan. Would it be okay to use a glass container instead? I've heard cake badly sticks to glass, but I'm going to butter and flower it thoroughly. would this work as a cupcake also with a frosting? Has anyone tried making this as a cupcake or muffin? And if so, did you use any type of frosting?